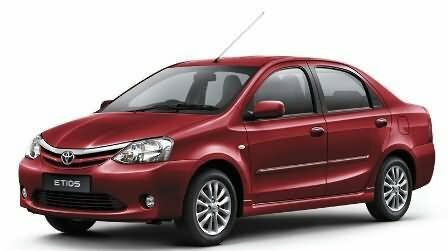 Toyota has launched its new entry sedan “Etios” on 1st December. The car has received much hype already and is sure to become a rage in the Indian car market. However, with its killer looks and powerful performance the car is sure give a tough fight to its competitors. Toyota Etios is available in six bright colours namely White, Celestial Black, Vermillion Red, Serene Bluish Silver, Harmony Beige and Symphony Silver. The car has swanky looks and stands out amongst the rest. The broad headlights, strong front grille and sparkling set of triangular tail lamps are eye catching. Rain wipers are provided at front and rear face. Standard rear side view mirrors are in body along with door handles, rear cowl and bumper. Toyota Etios has many comfort features. The car has a plenty of legroom, headroom and storage space. The storage space is also carved in door pockets and central console. There are approximately seven one-liter bottle holders. The audio controls are mounted on the three spoke steering wheel. The car is fitted with Air conditioner with powerful blowers, multi directional vents and Clean Air filter, Power Windows, Electric Power steering, Cooled Glove Box, Front Cabin Lights, Front power outlets (12V),Sporty Front Headrest, Pillow type rear headrest and Rear Defogger. Other comfort features include Tilt Steering, Tachometer, Digital Tripmeter, Audio system (with remote), Audio Controls on Steering Wheel (only on VX version) and USB and Aux-in Ready Audio (only in V and VX version). The interiors of the car are ergonomically designed to make the vehicle roomy and comfortable. Toyota Etios has state-of-the-art safety features. The car is loaded with EBD (Electronic Brake Distribution), Immobilizer, Keyless Entry (excluded in Etios J version), Driver Seat Belt Warning and Door Ajar Warning. Toyota Etios has two airbags as a safety measure in case of frontal collision. The car also has an impact absorbing body structure. The speedometer is placed at the centre which adds to the comfort of the driver. Other safety features include ABS and traction control. Toyota Etios has Ventilated Disc Brakes in front and Drum brakes at the back. The longer wheel base ensures better stability on the road. The front independent and rear-non-independent shock absorbers help in providing a smooth drive. 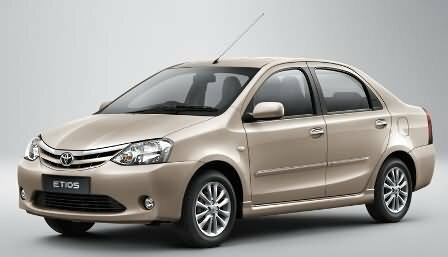 Toyota Etios has 1.5 liter, 2NR-FE, petrol, 4 cylinder 16V, DOHC engine which produces a maximum power of 90 PS at 5600 rpm and a maximum torque of 132 Nm at 3000 rpm. It is fitted with 5 Speed Manual Type Suspension. The improved electronic throttle control of the vehicle ensures good fuel efficiency. The engine also has (EFI) Electronic Fuel Injection system. Toyota Etios J Rs. 4,96,330. Toyota Etios G Rs. 5,43,665. Toyota Etios G Safety Rs. 5,94,165. Toyota Etios V Rs. 6,37,019. Toyota Etios VX Rs. 6,82,519.